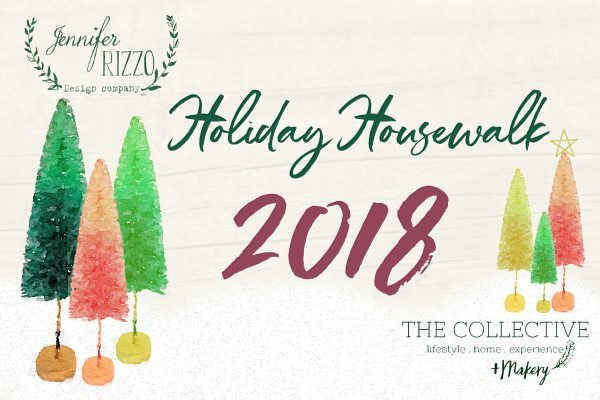 I’ve been scurrying around like a little Christmas mouse, getting our cottage all decked and holly and jolly, just in time for Jennifer Rizzo’s Holiday Housewalk 2018. 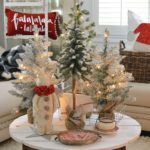 You can cozy up at home, and hop from blog to blog to see some of the prettiest holiday homes around, and get tons of decorating ideas! 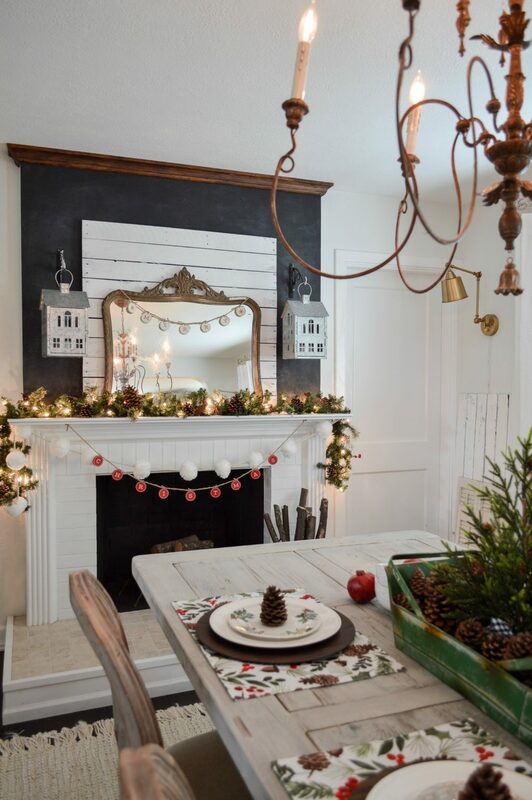 It starts at Jen’s and will be updated daily — You won’t want to miss a single house on this Christmas parade of homes! If you are visiting from Saw Nail & Paint welcome. Wasn’t Susan’s home beautifully adorned? I know her mom must be so proud of her! 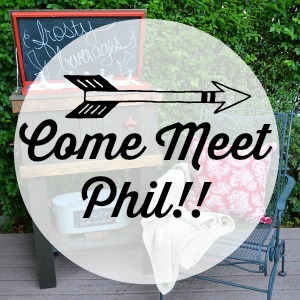 I’m Shannon, and to all my regulars – hello Foxy friends! 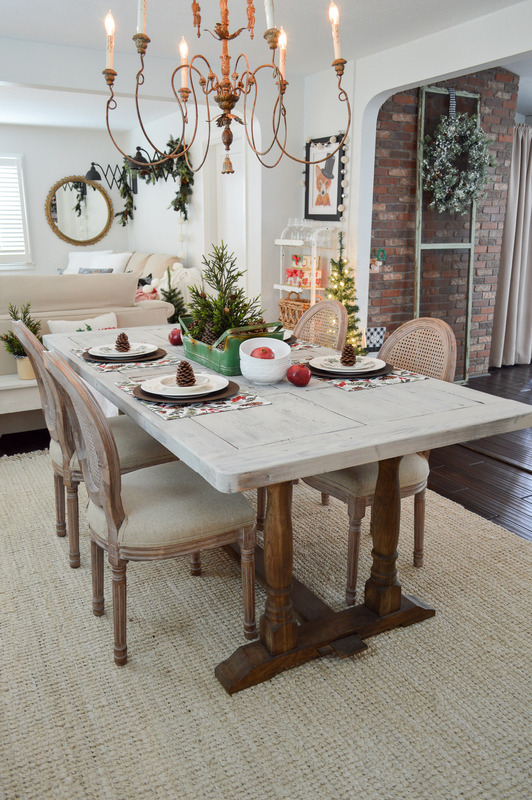 Let’s start off this Christmas tour in our very informal dining room. 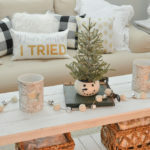 I’ve changed things up a bit since you last visited to see the Better Homes & Gardens “festive traditions ” holiday look. 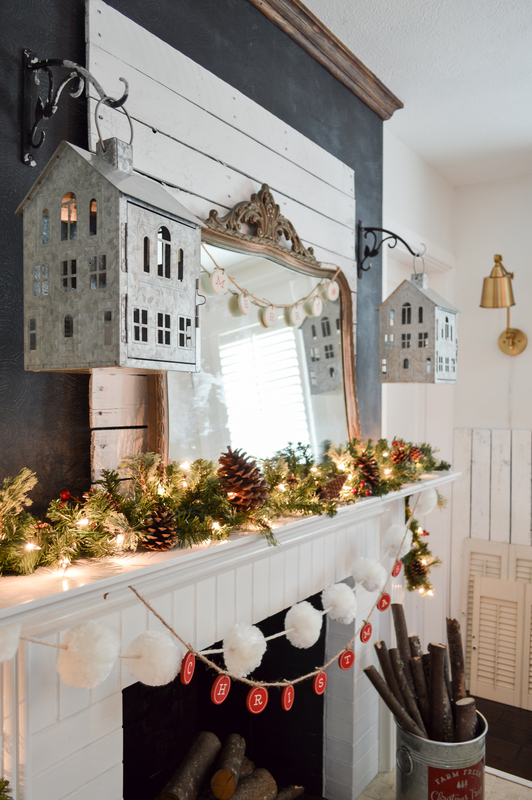 I paired down the hearth and brought in one of my old vintage mirrors to double the glow from the lighted garland, and cast more brightness into the room. 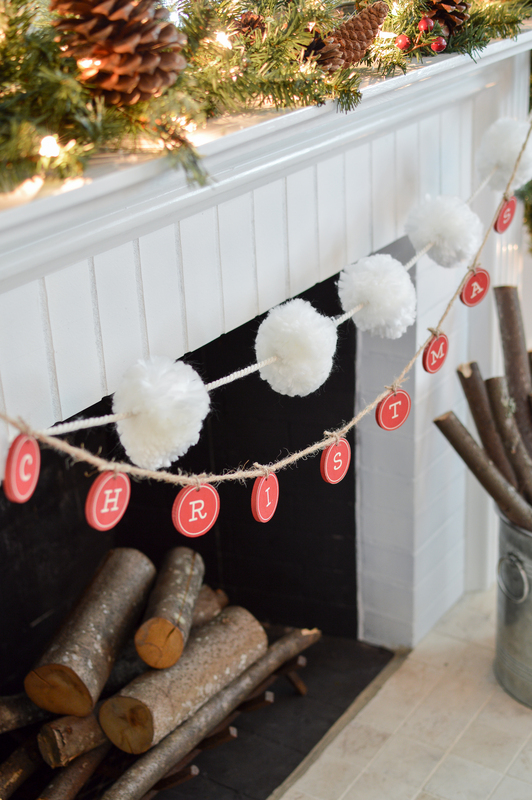 Both the fluffy pom-pom and wooden Christmas garland stayed put though. I’d been wanting to get those house lanterns hung up on the mantel, and Jimmy made it happen for me Sunday morning before I took pictures. That man. I tell you he is such a gift! 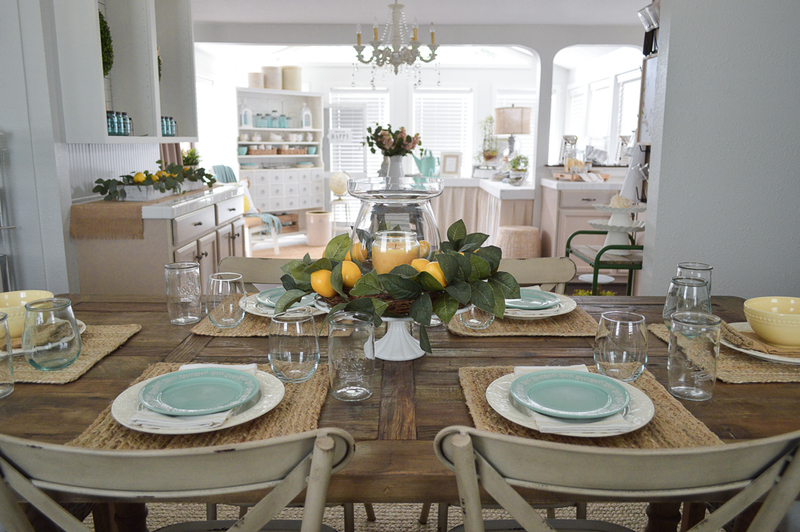 This table look was all about a casual, rustic feel with little fuss, and some natural elements. 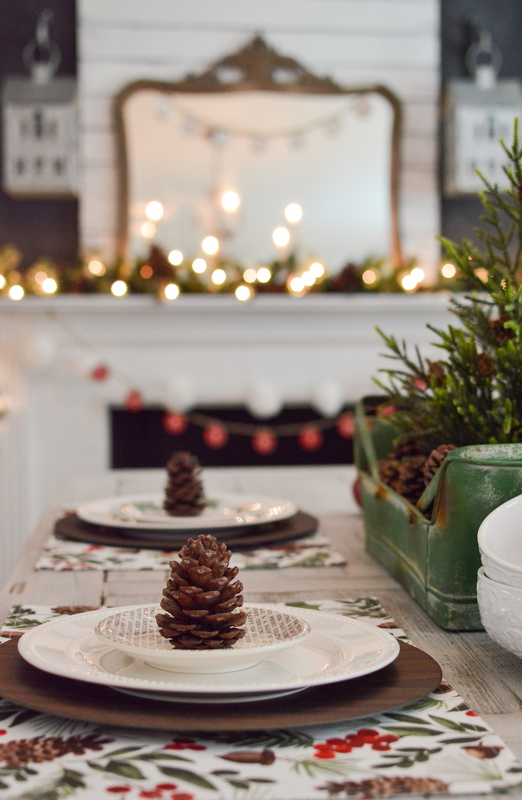 Easy for everyday and just the simple holiday I was craving this year. 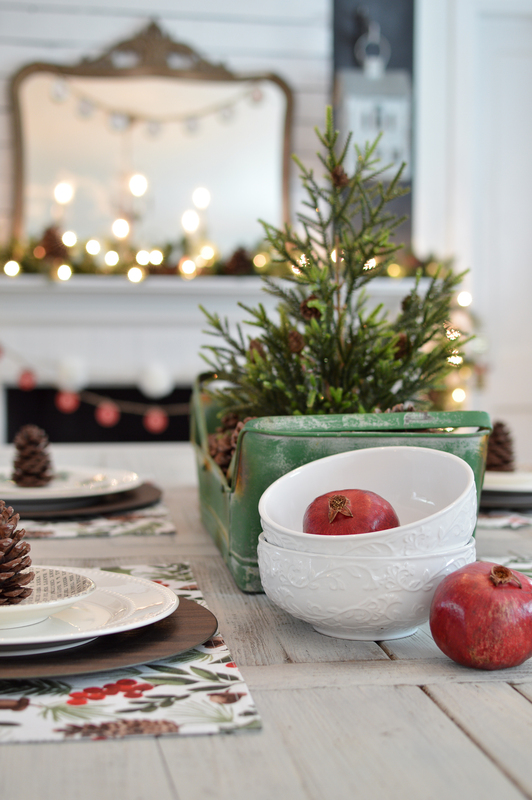 I can easily pop the holiday dishes from the last look on the table for Christmas morning, I gave them a new home in an easy to reach spot! 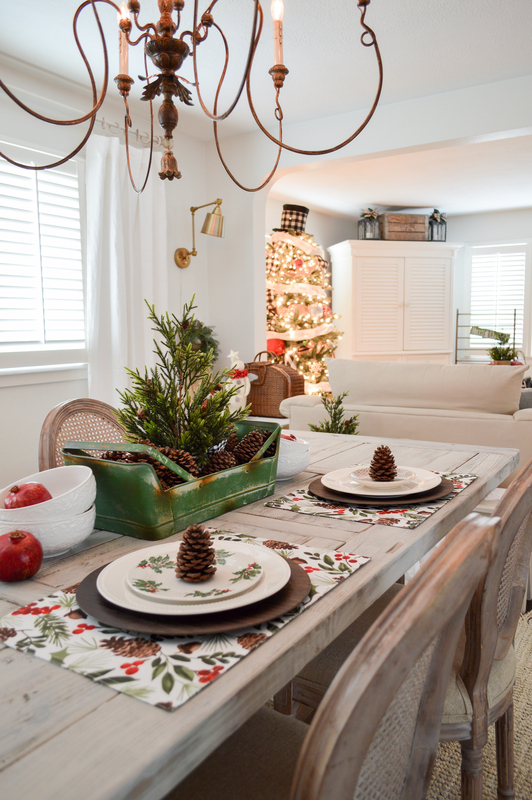 You’ll see them when I share our Christmas kitchen and the island later this holiday season. 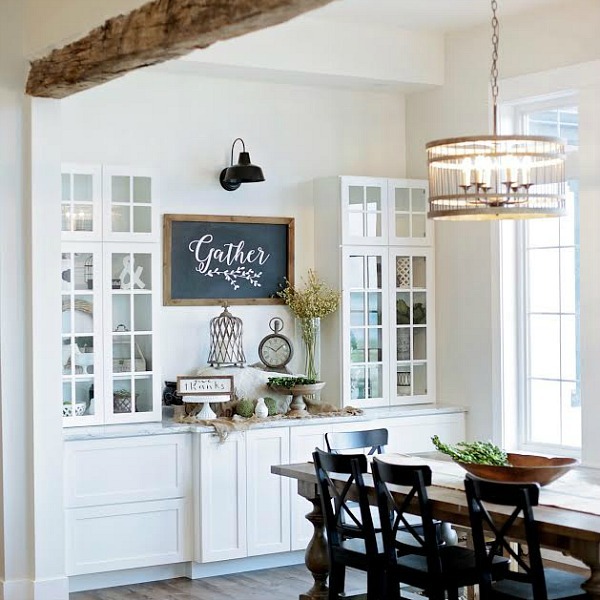 We totally stole the hooks to hang the houses off The Little Cottage. I thought the chippy paint would be just fine with chalkboard wall. And now I can get fresh ones to hang my flower baskets out of reach from the Deer in the Spring. Win-win. And there is a whole Pomegranate story, but it would require me to ramble more than usual, and no one has time for that. And even when I go simple, I’ve got to have some shimmer. I just have to interrupt the tour here for a moment to say, if you are waiting for you home to be perfect to invite people in and to entertain, don’t wait! Celebrate now! Our home is not perfect, and never will be. Take this tour for instance… my house is not the grandest of this housewalk line-up, but I decided years ago that I would keep at this blogging, for one, because I love it. And two, because if all the girls with the little houses & the little budgets quit… how would everyone out there in a little house, with a little budget feel with no-one to represent them? I wanted to be much farther along with my decorating before I shared my tour, but life happened. 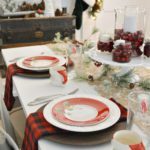 I wanted prettily wrapped gifts sprinkled around, and under the tree… and I definitely wanted my table makeover done, instead of halfway with only the top complete. haha. But, here I am! We are all a work in progress, and if you are anything like me, your home is too. Ever evolving. Sorry, I’ll get back to it now. Becasue we have a wee cottage style bungalow home, if you look from right, to the left, you’ll see the whole living area. 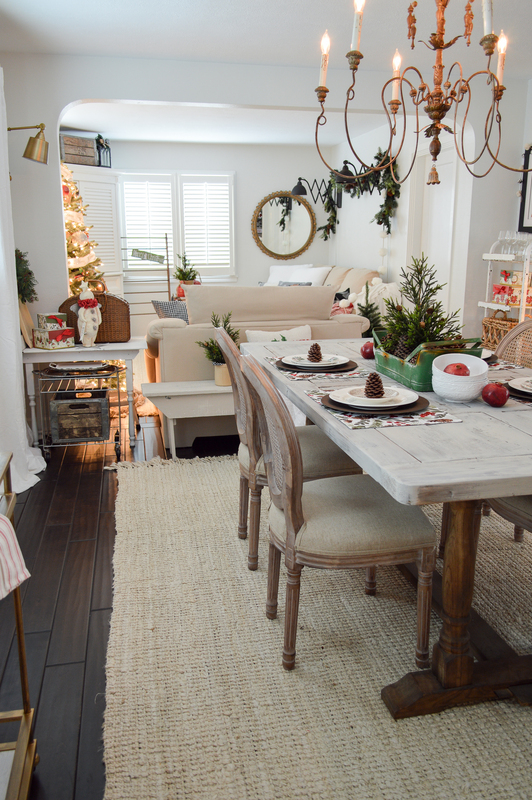 Now that you’ve seen the dining room… say hello to the living room. 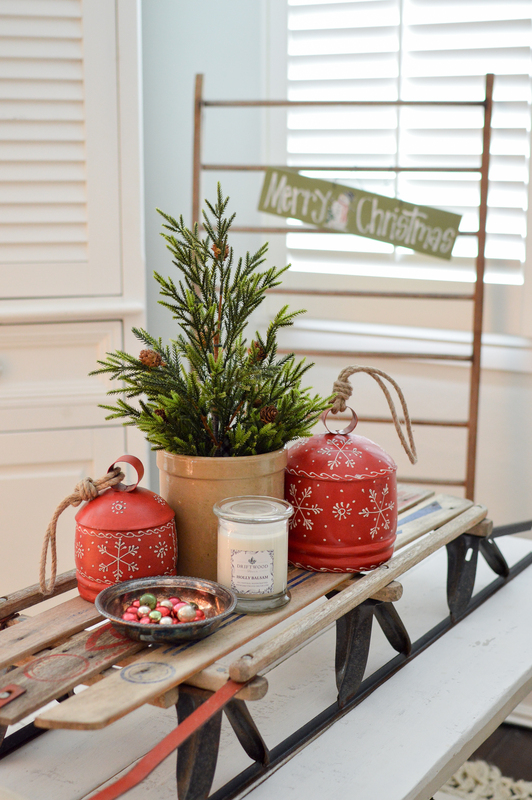 Some vintage crocks & enamel pots were filled with trees. And I got out some old favorites, and some new. There is a reason we all love them so much right? 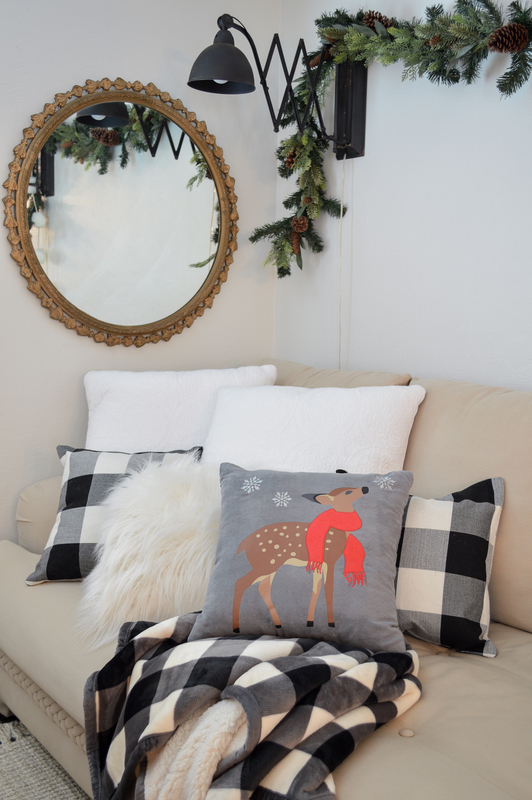 Instant cozy. 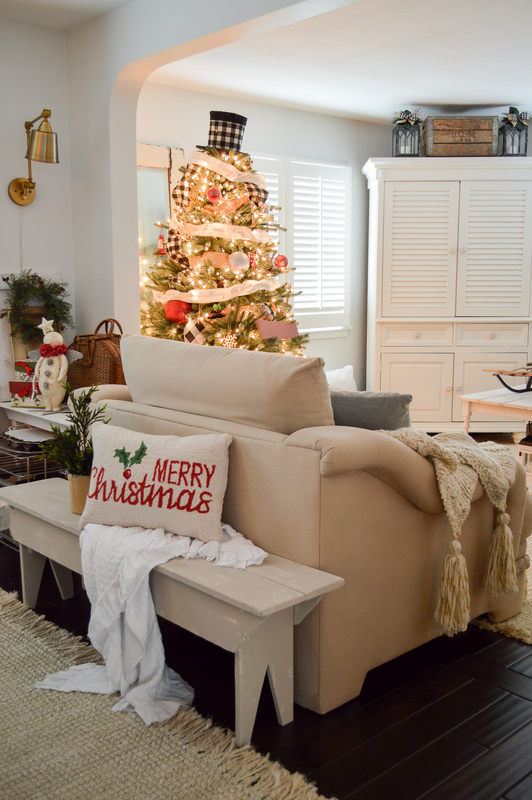 I shimmied all the furniture around so I’d have room for a full size tree this year, and that meant a lots less little side table and surfaces to adorn. Which worked out wonderfully with my, try not to “decorate yourself to death” goal this season. And somehow, this vintage sled landed on my coffee table. Lucky me, I had it decorated lickety-split! That was great, because the tree… oh this tree. I joked with my mom that is took me ten minutes to put up, ten hours to decorate, and only ten minutes to do the rest of the house. I have determined that I am decidedly not an adept ribbon festooning type of individual. And also, that perhaps the white ribbon Merry Christmas was better suited for a flocked tree. Which we all know I love! 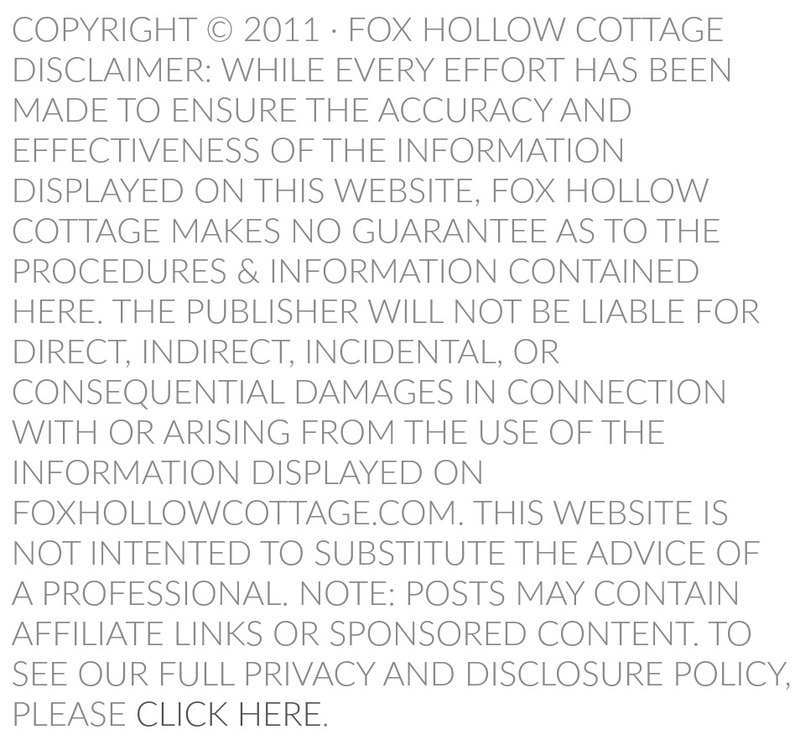 But I sacrificed it to The Little Cottage this year (coming soon). A statement piece on a tree is always a must for me. I love stuffing something large in a tree as a big focal point! 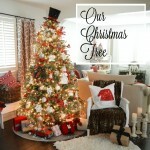 Like I did a few years ago with my Snowman Tree. This sign was picked up at JoAnn’s and I am really happy with it, and the message! 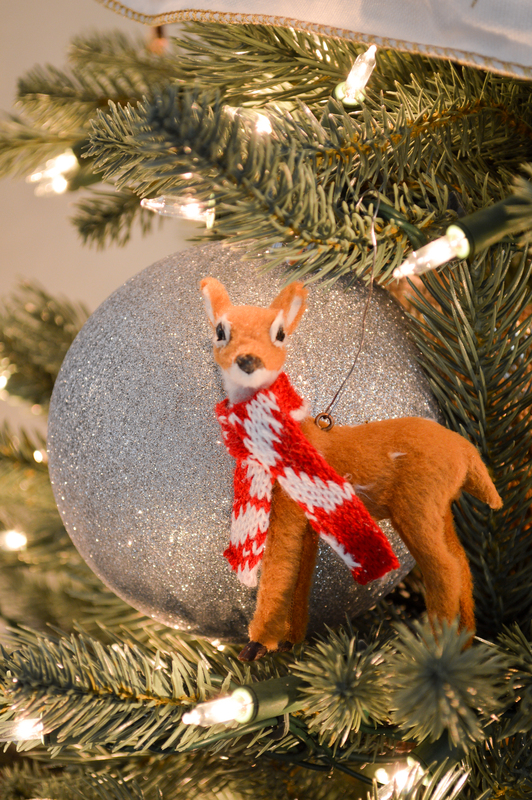 The felted Deer was just too sweet to leave behind. There is a lot of time between now, and Christmas, so we’ll see what changes? 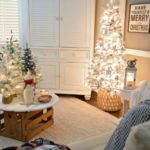 I say I want simple, but I also love stuff and lots of layers, and there are definitely a few more personal touches I want to make to our homes holiday decor. I’m just a walking quandary tell ya. I know for sure that Jimmy made me a HUGE sign base for over the sofa, so I hope to get that holiday’ed up and I’ll try hard to share it with you when I do! 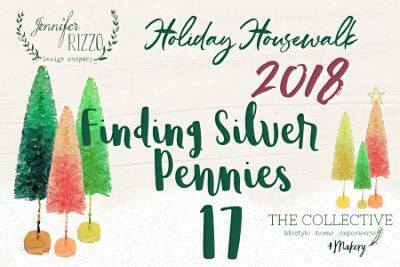 Thank you so much for stopping by today, please remember to make time for the next stop, and say Hi to Danielle at Finding Silver Pennies for me… you are in for a treat at her sea side home! Some source links may be affiliate — your cost will not increase. Shannon you have outdone yourself! 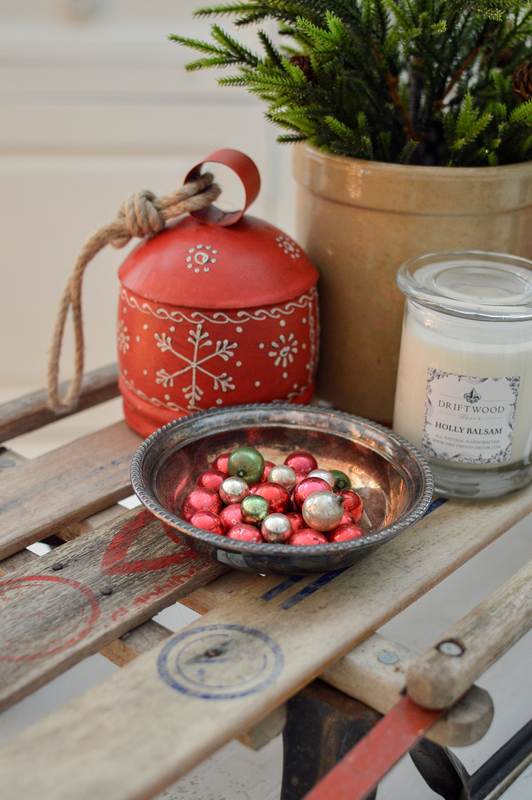 My favorites are the house lanterns, sled on table and the screen door with wreath! 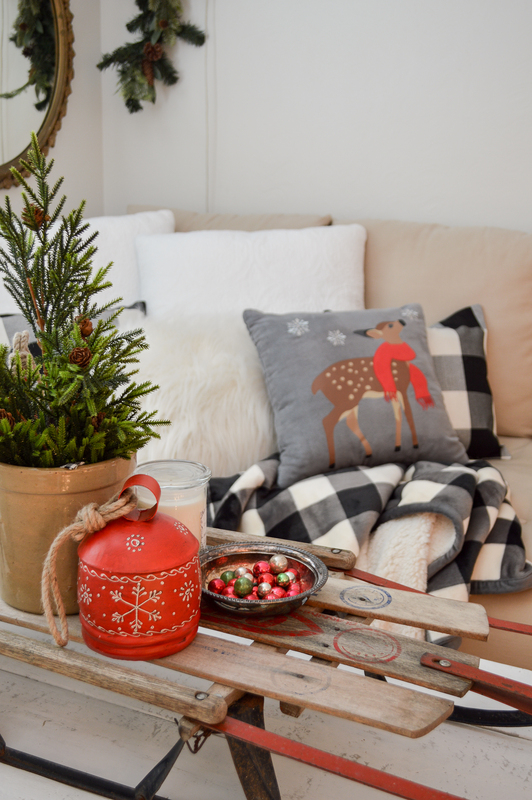 So fun and festive and cozy! Thanks Kel! I’m sure you are looking forward to having your girls home for Christmas. Your home looks so warm and cozy. Great job….I always enjoy reading your posts. 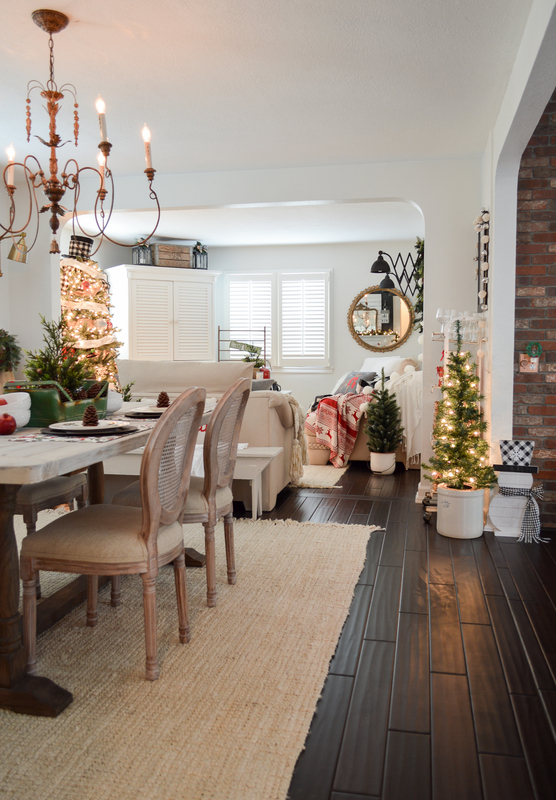 I LOVE everything in your Christmas home. 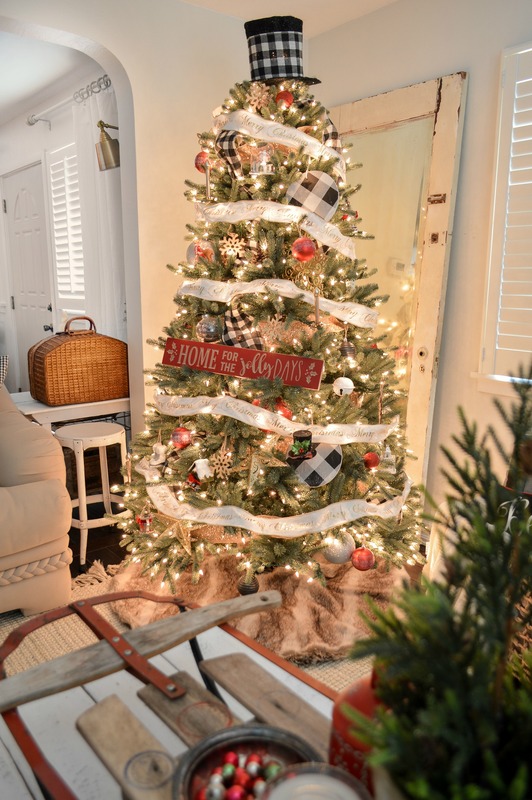 From the hanging house lanterns in your dining room to the sled on your coffee table to your creative tree – so much to take in. And I struggle with just how much is just enough vs, too much constantly too. The struggle is real!! We could have the BEST time shopping together, don’t you think. Happiest holidays to you and yours. With our upcoming demo, I was kind of thrown for a loop knowing HOW much to get out. Maybe next year I’ll go crazy. I already miss some of the stuff I didn’t use. 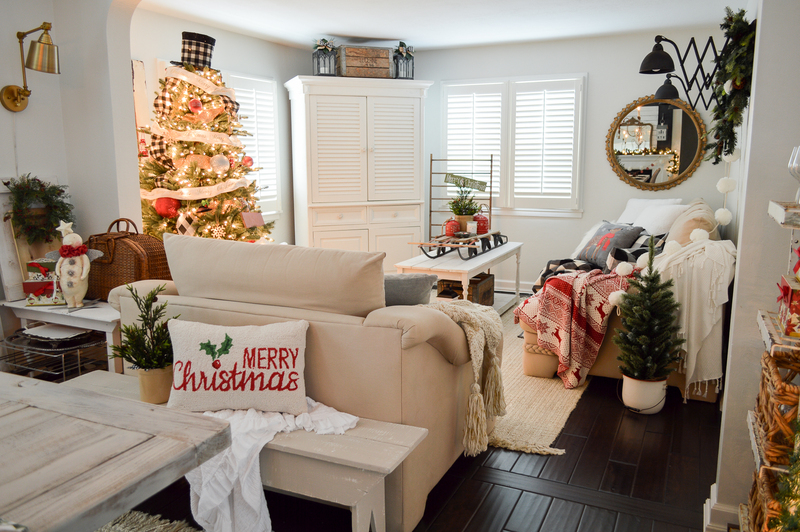 Your home is looking so cosy and welcoming all decorated for Christmas Shannon. Above all, I love your sentiment for celebrating today and for being happy with where you are at in this very moment. 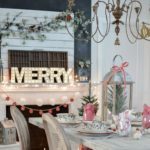 Your home looks fabulous and real,… it reflects your beautiful soul with each lovely piece you chose for your Christmas living and dining room. 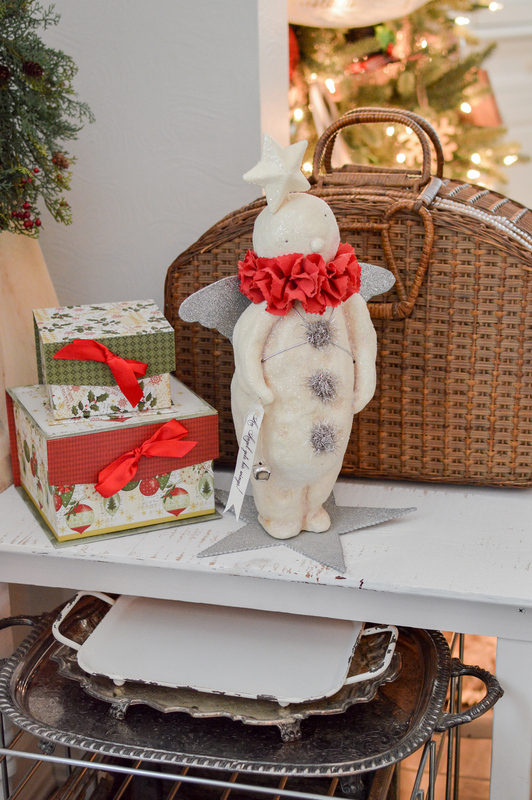 It doesn’t matter if your table project isn’t finished yet or if the gifts aren’t wrapped…. we come to visit you and keeping it real, well that’s perfect in my book. 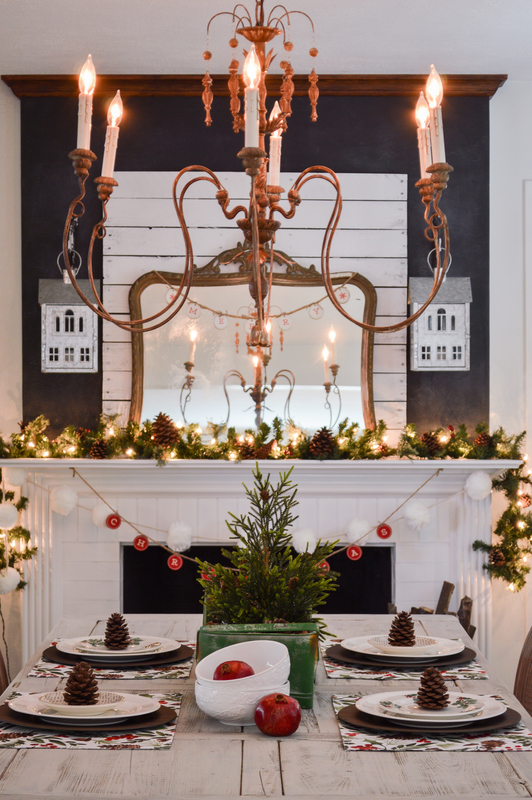 Love that sleigh on the coffee table and oh my, the house lanterns… LOVE them!! THANK YOU Kerryanne, that was just the sweetest! Shannon, I just love your house! So warm and cozy and comfortable. You did a beautiful job decorating. Enjoy the season. Thank you Robyn, you have a beautiful Christmastime. It really is true. We need to be happy everyday. Life is short and fragile. Merry Christmas to you Tanya! Pat you are so cute! Not when it’s HOT. lol. This coastal girl would melt! So happy you liked it! Merry Christmas to you. 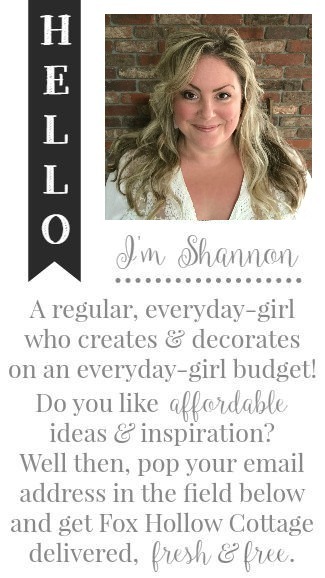 I loved every single detail, Shannon! 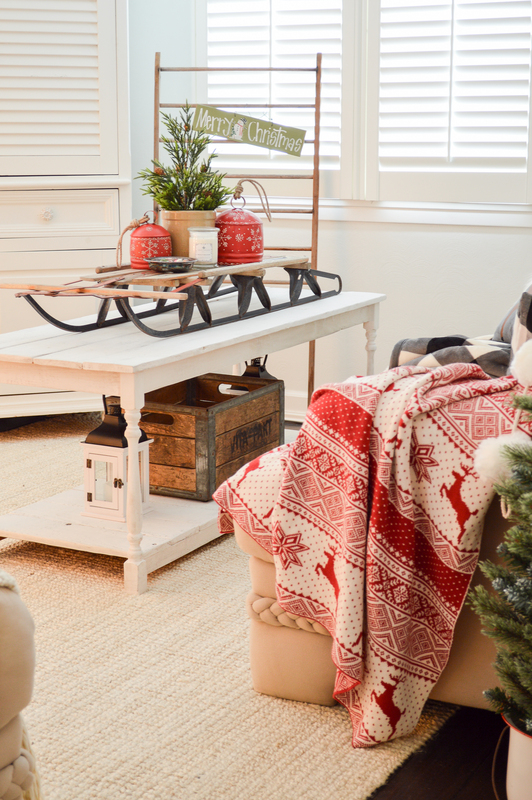 Oh my goodness, the way you styled the vintage sled was beautiful. I’m heading out to the garage for my old sled right now.😃 so happy to be on this tour with you! Wait! When you see Courtney sled, you might want to hang it up. Dang that girl is AMAZING!! 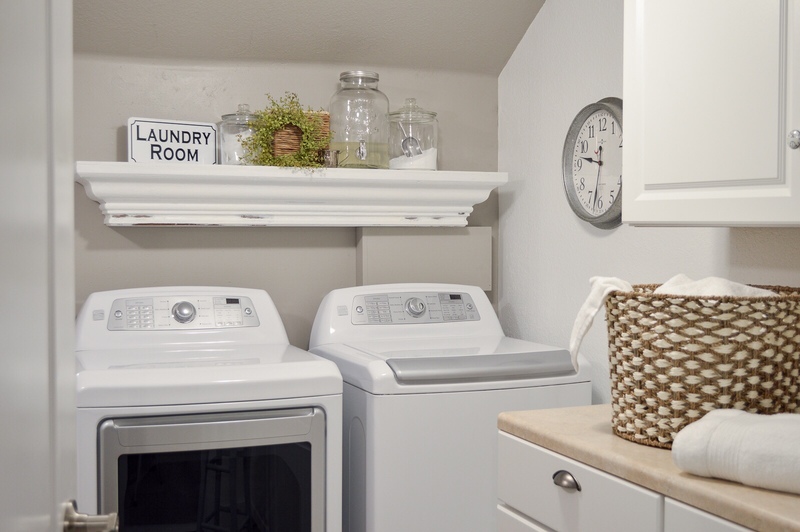 Thank you for sharing, Shannon – your home is just beautiful!! I love all the little trees! I am really tired of seeing all the “perfect” homes – because, in real like, none of us are perfect. I feel like you are “real” and it makes me feel good. 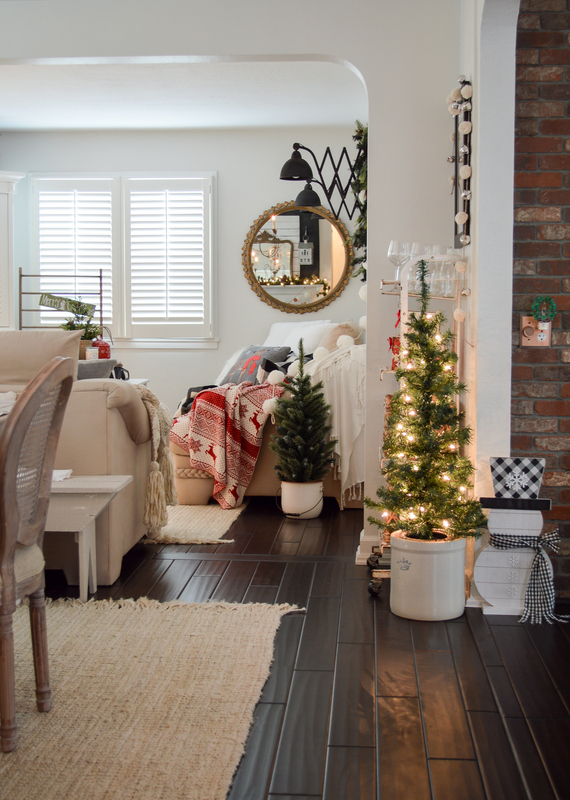 I want to go a little more simple in decorating, too, but like you, I love stuff! 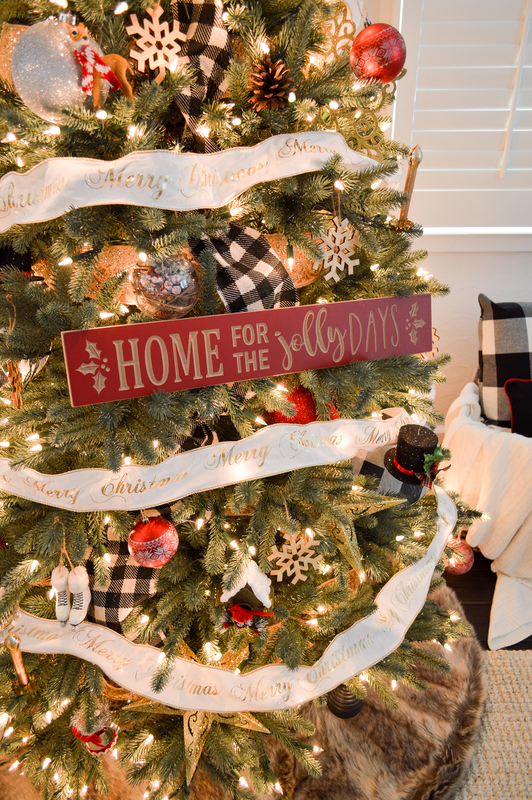 🙂 I decorate for my husband and I and what makes us feel welcomed and safe when we come home. I am looking forward to seeing what else you do and also for the sweet cottage. You are a jewel!! 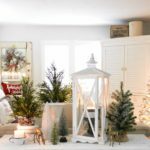 Patty, I made a promise to myself to try not to over-stage, versus just “decorating” – it can be a very fun creative outlet but I figure I don’t live in a storefront window, so my house shouldn’t look like one. I’m glad you like it and it feels inspiring to you! Thank you! Shannon, I love your little cottage and so wish we could downsize. I love smaller cozy homes. You have it decorated so cute! Kim, it took a little time but I LOVE our smaller home 99.9% of the time. We have done just fine all thee years with less house and less to clean for me! I could never have blogged and kept up our last home and property. THAT was a full time job in itself. My eye was drawn to your stack of beautiful trays!! I love trays!!!! Oh Terri I am too! We’ve been running to get the houses buttoned up and then I got sick and I don’t know if I’ll get as much done this year as I had planned. Good luck catching up 🙂 Maybe we won’t get to it all, but that’s okay right! 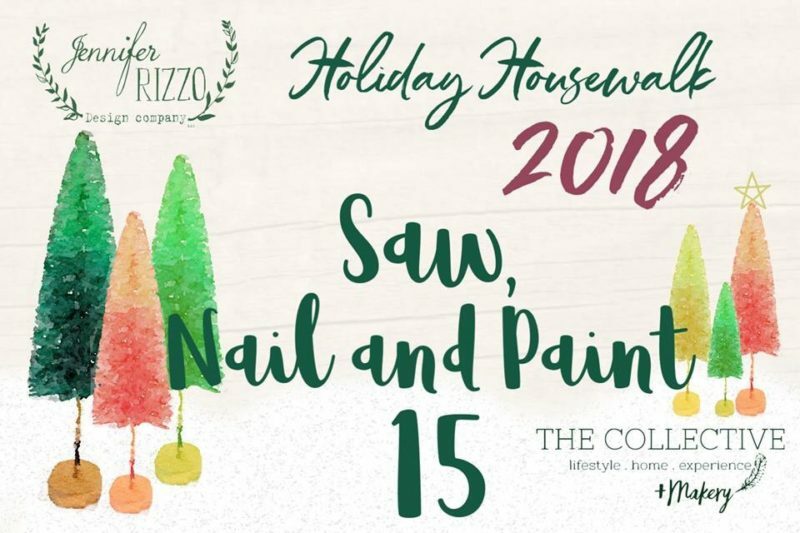 Welcome to our Holiday Housewalk Cozy Cottage Christmas Tour! 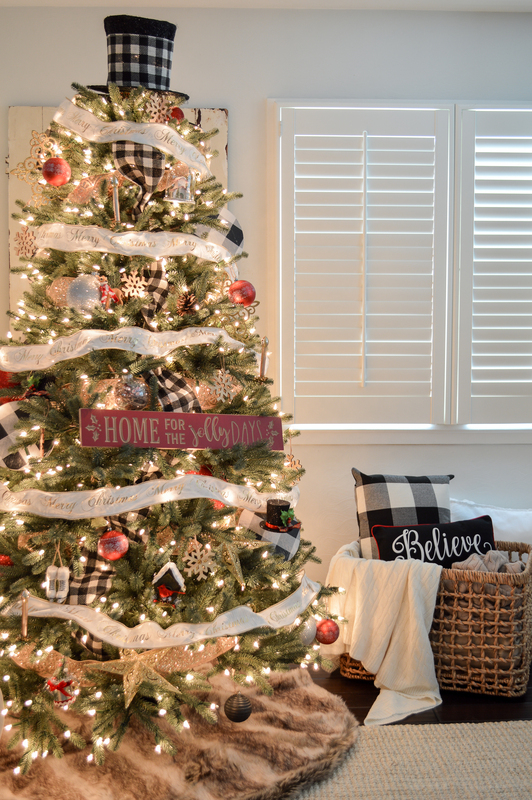 You'll find simple decorating ideas to deck your halls, from my house, and dozens of others!